Yup, that’s right. All you need is some cream and a jar. Being a chocolatier, cream and butter are like old friends to me. I use them both in many of my recipes, and sometimes, there’s a little leftover cream after a spell in the kitchen. I find it very hard to throw anything with even a smidge of potential away – so this is the perfect solution. Make butter! If you can, use double cream as this will yield the most butter (double cream has a higher fat content than say, whipping or single). Pour your leftover cream into a jar, filling it about two-thirds full. I used around 150ml double cream, which was what was left in the fridge and didn’t have much life left on it. Screw the lid on tight. Shake as if your life depended on it. Put your butter onto a board and press out the remaining buttermilk using a wooden spoon. 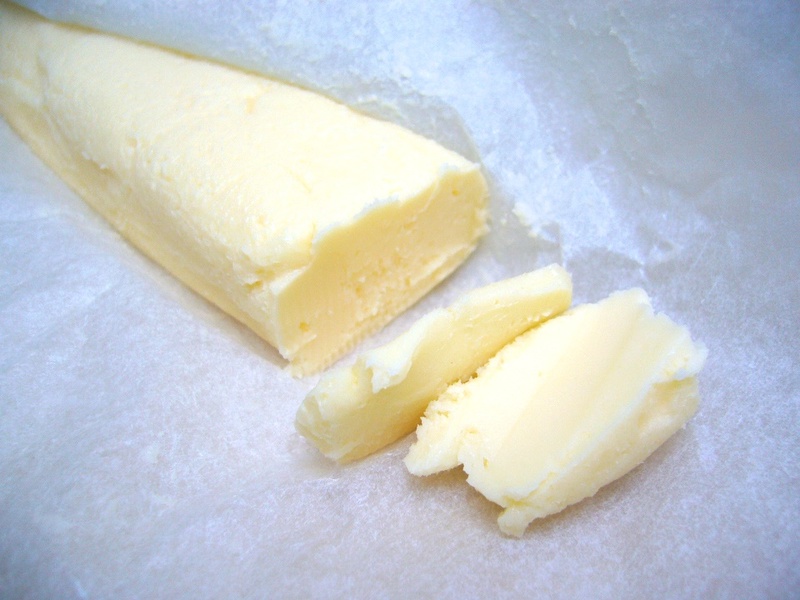 You really want the butter to be as dry as possible – any remaining buttermilk will make the butter spoil as quickly as cream. You can also rinse your butter to get rid of any last remaining drops of buttermilk – knead it under cold running water. Now is the time to add any flavourings, if you wish. Dry the butter by gently dabbing with a paper towel and knead in sea salt, dried herbs, garlic powder or whatever takes your fancy. Shape it and wrap it in greaseproof paper, and marvel at what you have just made before popping it into the fridge. Ta-da! Homechurned butter! Steph, this is amazing! !! Try it for yourself 🙂 Very satisfying!